So . . . is this a new hungry Hawick or another false dawn? Hawick make ugly look beautiful. It was a stretch of defensive intelligence – of abject cruelty – combined with enough attacking guile that helped Hawick secure one of the most important wins over Gala in the club’s recent history. It was wild arms, tireless legs, and throbbing hearts. It was ravenous determination and frantic efforts. It was Hawick toughness, the us-against-the-world conceit and a shutting off of past disappointments. It was the exact circumstance the Robbie Dyes wanted to find themselves in – willed themselves into – and that meant a “street fight” or “battle royal” against a local rival in an all-or-nothing relegation showdown. It wasn’t pretty, it was ugly as the conditions dragged the play down to its most basic level. Hawick almost threw it away with Bruce Campbell, Bruce McNeil and Stuart Graham all spending time in the sin-bin at various times throughout the match. Ugly would be nice. Ugly would be wonderful. With this Hawick team, in the eyes of Teri lifers, ugly makes anything and everything possible. The final score was 16-6, and the Greens had to earn every inch they gained against a Gala side throwing everything at them, including the kitchen sink. But Hawick somehow managed to dictate the nature of the contest from Ali Weir’s opening penalty. From there, the Maroons were held to just two Gregor Hunter penalties for the rest of the contest and were browbeaten into mental errors and turnovers that has left them all but relegated and the Greens guaranteed at the very least a relegation play-off. “It wasn’t spectacle, it was ugly, but it was a gutsy performance that got the job done,” said captain McNeil. So after it all what was Hawick rugby in 2017 and what does the future look like? It was McNeil, who has at various times this season willed his team to victory with a style of play that cannot be found on a training pitch or gym. His tenacity does tread a fine line between brilliant and foolish, which has found him on the receipt of the referee’s disciple, but the do-it-all captain is at the heart of what makes Hawick, Hawick. It was Ali Weir and Lee Armstrong, who have poured in points at critical times consistently for the Greens. It is the next wave of young talented stars. Unlike their richer and geographically fortuitous rivals, Hawick must blood the next generation of Teri starts and in 2017, despite having one of the worst records in the Premiership and almost being relegated, the Greens are stocked with young talent. Kirk Ford, Andrew Horne, Grant Huggan and Kyle Brunton – who came off the bench to score the game winner Saturday – in addition to Premiership standouts Darcy Graham and Fraser Renwick, both Scotland under-20 caps, are part of a foundation for what Hawick hope to become. 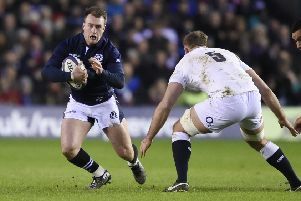 “Playing for Hawick was always something that meant a lot to me so once I had that taste early on this season I wanted more,” said Brunton, a Scotland Under-19s standout. “They have been at various times this season thrown into the fire and for the most part they have dealt with it all well and stepped up. “I think we are only now starting to see the capabilities of what some of these guys can do. “Their potential is there for all to see and it does give Hawick RFC a really bright future ahead, despite a very difficult 2017 season. Hawick are a long way off winning the BT Premiership, they could still find themselves in National League One next season if results don’t go their way and they lose a one play-off match against the second best National One team, but the future, if you look hard enough, doesn’t look all that bleak.